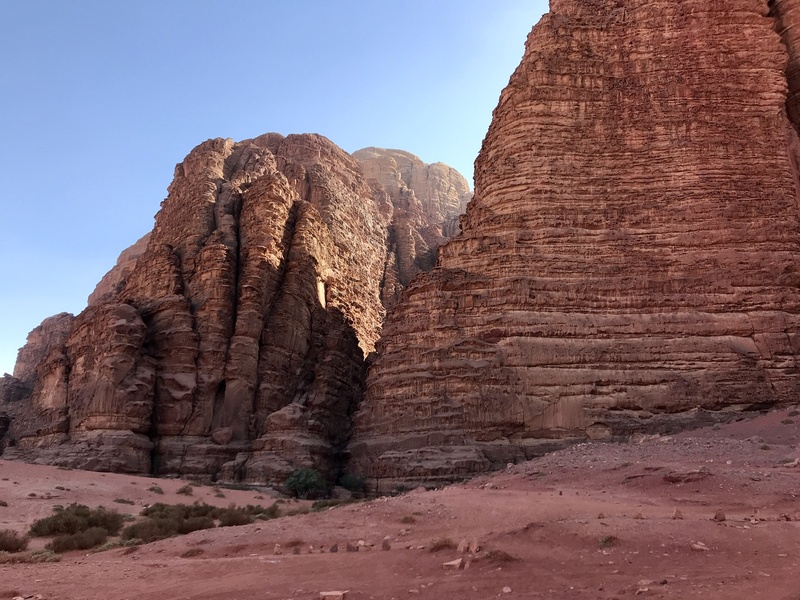 Brice Pollock » Can I Find a Climbing Partner in Wadi Rum? Upon closer inspection, many mountains resemble a scoop of ice cream melting in the intense desert sun. Ridges of the substance scoop curling into dikes along its sides. As the liquid collects into a berm until leaking down and over this edge, it creates small caverns below and indeed of holes. It looks like a jungle guym to a climber, however the rock was mysteriously dangerous. Often the sandstone here is soft with even black, typically hard stand stone potentially only connected to the mountain via a tan, dusty core who’s only desire is to detach and crumble to join the desert below. Hopefully without you still attached. 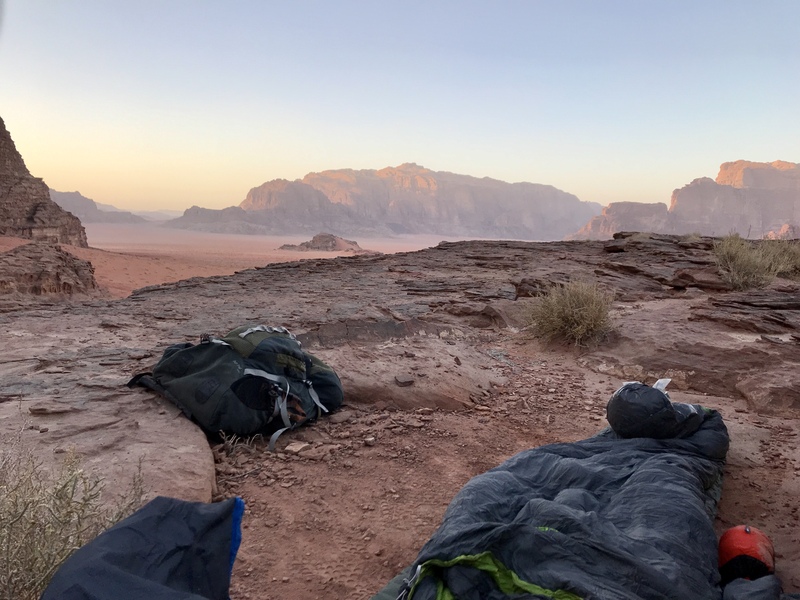 Regardless, this place is incredibly beautiful and features rich backpacking, climbing, canyoneering and scrambling experiences for the active minded. 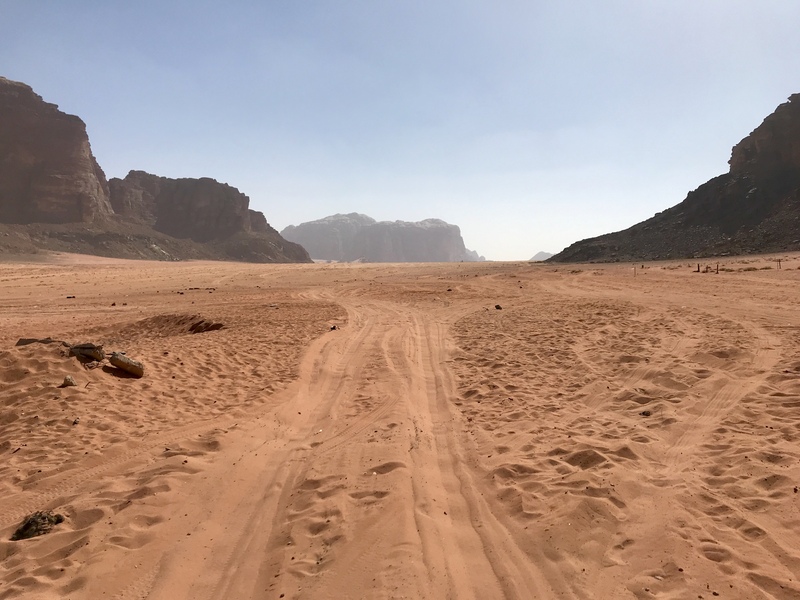 I visited Wadi Rum without a partner or rope in hopes of acquiring both. Unlike most areas I’ve been to (including international) there is no climbing camp or climbing hostel here. In early November the sun was intense during the day but the rocks never felt untouchable. At night it got cold but was plenty warm in a tent with a 20 degree bag. I saw 6-7 climbing parties on chance so I expect there was a dozen total in Rum. If you still want to go and try to find partners your best bet is to stake out the rest house and ask every person with a rope as they walk towards their climbs. Which… I felt was a little intrusive and probably why I didn’t find a partner. Looking to salvage my days as I tried waiting for partners to materialize. I spent my first day with the desire to free solo a Bedouin Route (Steps of Assaf < 5.4) up Jebel Rum and sleep on the top. I quickly become scared off this idea after a couple holds detached the rock. Forcing me to catch and valence myself with a heavy pack or tumble downwards. Instead I pointed my boots towards Khazali Canyon and became a lone figure walking across orange sand in the mist of continuous (but not disruptive) 4×4 vehicles giving tours to the normal tourists. It took two hours to reach the canyon and a short hike up it required some 3rd class scrambling until I shot East looking for a discrete campsite. There aren’t a lot of regulations here, but I read that it is polite to camp away from the many Beduin camps out here. Given the clear incomes from tourism and the absolute friendliness of all Beduin I interacted with it seems more out of respect than safety. Finding a nice rock outcropping I set out my sleeping pad for a night under the stars. 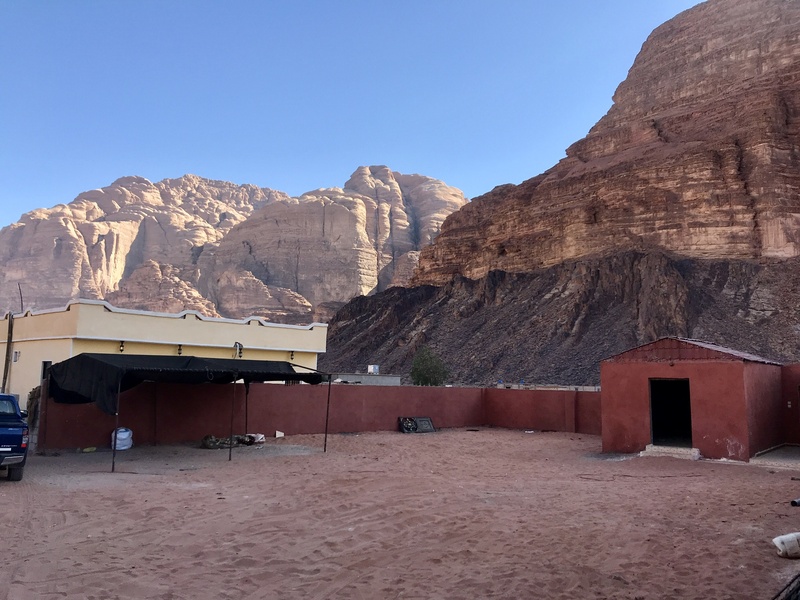 As dusk at 5pm, the call to prayer soared out from Wadi Rum Village. Echoing beautifully off the mountains and through the valleys. A wonderful touch to one of my favorite parts of visiting Jordan (the call to prayer), even though it woke me up in Amman at 4:30am every day. Just as the stars started to twinkle on moon rose with such intensity that it felt like a a second sun. It illuminated the desert all night until itself being replaced by the true sun the next day. I capped off my trek the next day by walking out to Um Fruth Rock Bridge (which was okay, no Arches Nat. Park). I hitched a fun ride on top of a water tank truck resupplying the Bedouin camps when I got a little disoriented and off track on that journey. Finally I returned to Wadi Rum Village to take up residence with my Behouin Host Abdallah I was connected to from a friend and guide in Amman. The next day I spend scrambling through Rakabat Canyon and up a peak. Until the following day after that I gave up waiting on hypothetical partners and headed to Israel. I really enjoyed the small relationships I made here, to the tank driver who gave me a ride and later stopped me on the street on his way to the visitor center to chat and invite me for tea. To listening to Abdallah’s elder family member recant stories with such exuberance and hand gestures that even in Arabic I felt engaged by it and the laughter. To the sharing of a couple meals with the men of Abdallah’s large extended family. Sitting in the ground, using our right hand to scoop saffron rice and spiced chicken into balls that can hopefully make it into my mouth without spilling all over my pants. I am very excited to come back and explore more with a confirmed partner and climbing gear. There are few guides here who know technical roped climbing but many familiar with scrambling. Everyone spends most of their time with the 4×4 tours so it’s likely a climbing guide will be busy so it might not be possible to connect with one on random. I would try to connect with someone beforehand. I personally stayed with Rad al Qudah of Tropical Deserts in Amman and can vouch for his knowledge. I was going to climb with him but he had a last minute flare up of his knee. 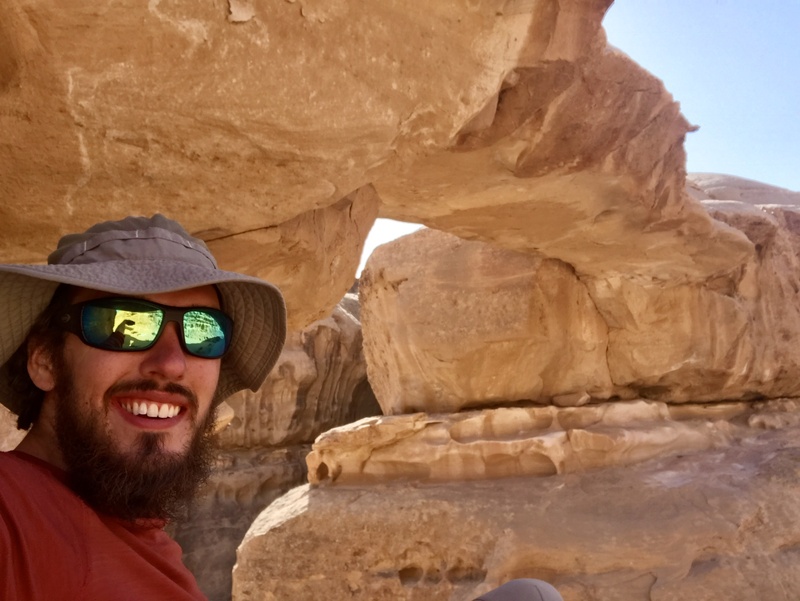 I also stayed with Abdallah Dikilallah Salam of Shabab Sahra (lonely planet) in Wadi Rum who is IFMGA certified, has a great sense of humor and was very kind. He is working on a climbers camp by his house where you could tent which would help with the community here. I never got on an established rock but I spent my first day with the desire to solo an easy Bedouin route. I quickly learned the rock is unlike anything I’ve experienced in desert Moab or Red Rocks climbing. The normal signs of light in color or sandy or hollow dictating quality are not sufficient. I had a couple holds break on me while soloing that were black but contained an inner core of the soft tan stuff. It seems you need to pay much more attention to the layering. For this reason, it might be useful to hire a guide to get oriented your first climbing day. 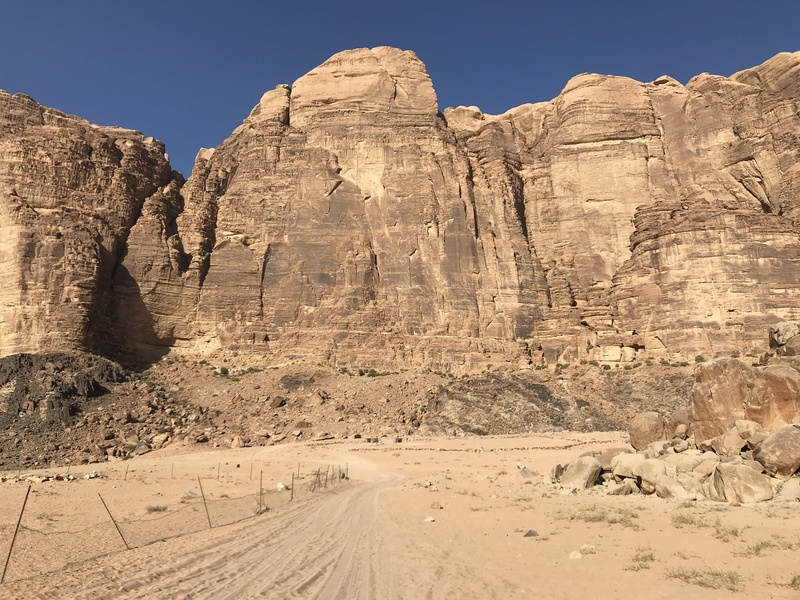 The Bedouin know the rock very well, they’ve been climbing it their whole life. If you don’t hire a guide, I strongly recommend starting out much below your typical lead. 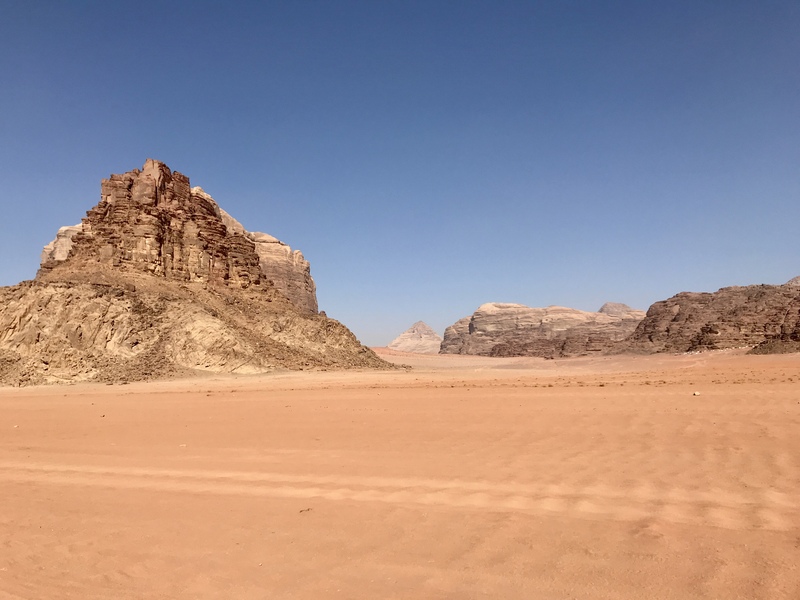 The only guide book remains Tony Howard’s Treks and Climbs in Wadi Rum. Aside from that you can glean what is possible from thecraig, mountainproject and ukclimbing websites. The is also a master book of climbing beta at the rest house. Tropical Desert has some topos on climbing in other locations in Jordan. Most climbing here is multipitch trad. 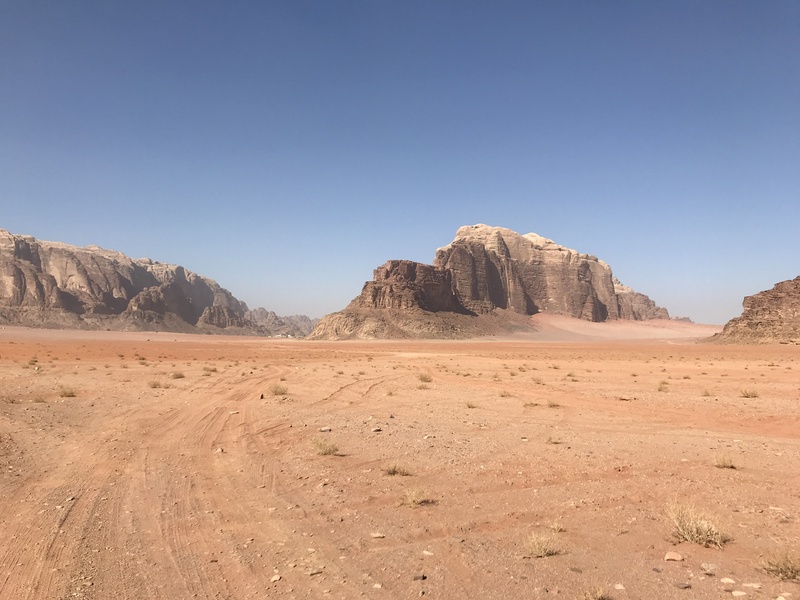 There are many routes walkable from Wadi Rum, most West of the Rest House on Jebel Rum. There is a Sport climbing area East, on the other side of Jebel Um Ishrin since Tony Howard’s book. The best adventure is probably to go out to the desert and camp for a few days using a 4×4 ride to get 3-4 L pp / day of water with you. It’s possible to walk but the water weight is problematic. 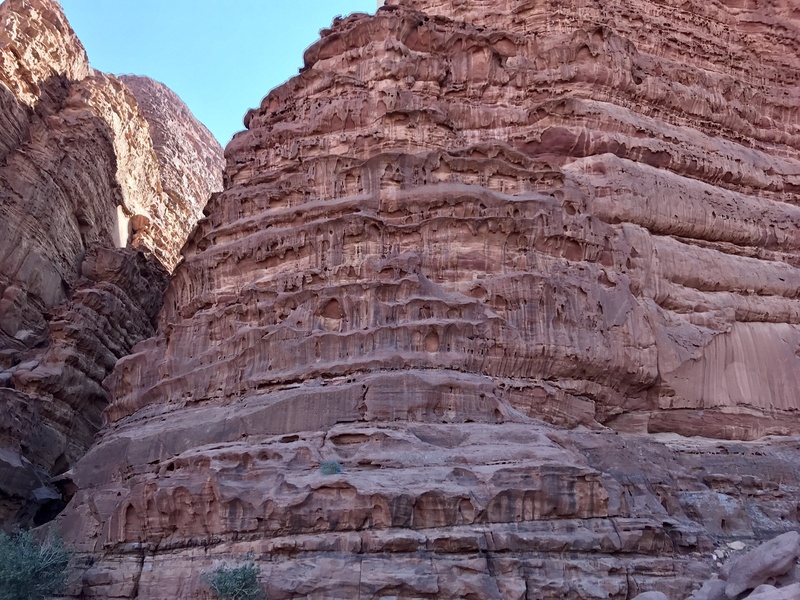 To give you an idea of how long it takes to bet place, it took 3 hours through Rakabat canyon East through Jebel Um Ishrin from Rum Village and two hours hike to Khazali Canyon from Wadi Rum. It’s fun to do for trekking and very few use their legs instead of a 4×4 but weight might be prohibitive for establishing desert climbing camps. Navigation here seems pretty straightforward but once a couple hours into the desert you can easily get disoriented since the rock faces to navigate by look very similar on the ground. I used Tony Howard’s book, this summit post map and this electronic copy of the visitors center brochure. Surprisingly enough my offline maps app maps.me actually showed most of the attractions, common driving tracks and even Rakabat Canyon by gps location. So it helped orienting considerably. It’s possible to find canned vegetables, beans and hummus as well as spices, chips, bananas, sweets and bread. The cost is very reasonable with groceries costing me 1-1.5 JD / day. 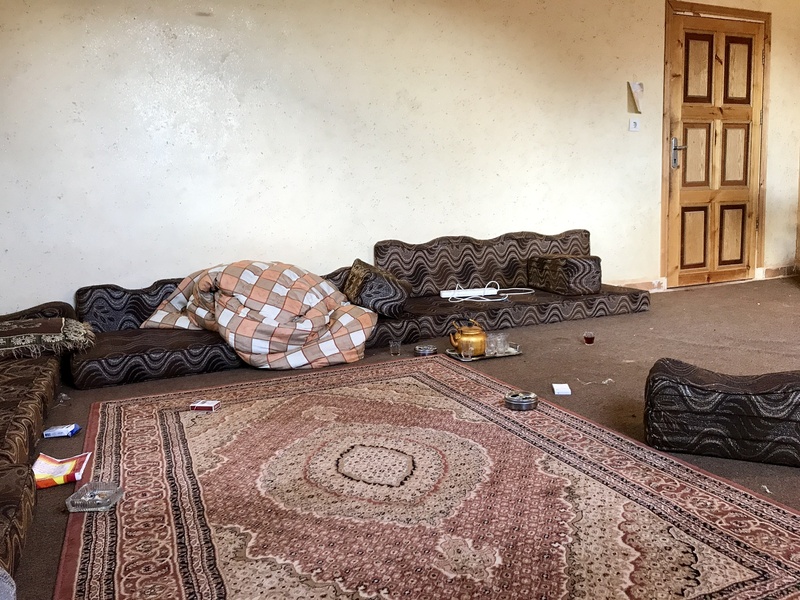 There is one place outside of Amman that was supposed to have gas canisters for stones but I wasn’t able to check it out. You won’t find these in Jordan. A 4×4 transit is quite expensive and will cost 20-40 JD, maybe each way. Not many people take camels. I don’t know what accommodation costs in the village. There are no camping regulations, just the unspoken rule to camp discretely and not next to the Bedouin camps. I found some good bivy spots just out of town near climbs on Jebel Rum. If you walk through town or ask it is very likely you can stay at someone’s house or in their yard in a tent for cheaper than a hotel. Recommended standard double rock with many slings for any of the easier, ling e Bedouin routes. Recommended to bring two ropes or some other system for full rope raps. There is no ability to rent climbing gear outside a guide in all of Jordan. There are many dogs and chickens in Wadi Rum Village. One dog bark echos off the walls to sound like five. Chickens apparently become confused by the moon and like to crow. So it can be a chorus of sounds at night, you might want to bring earplugs if sensitive.